Under threat of being erased from Denver’s urbanscape, the historic neighborhoods and families of Globeville, Elyria-Swansea (GES) are taking a stand against displacement and housing shortages. To preserve affordable housing and community identity and values, neighborhood residents have become leaders shaping their own better future through the creation with nonprofit partners of the GES Coalition. Together they have established the GES Community Land Trust and GES Affordable Housing Collaborative to ensure long-term community ownership and oversight of housing. The GES Affordable Housing Collaborative — a partnering of community members in the GES Coalition, nonprofit Brothers Redevelopment Inc. (BRI) and the Colorado Community Land Trust (CCLT)— has received a $2 million grant from the Colorado Department of Transportation for mitigation of impacts from expansion of Interstate 70 through the neighborhoods. 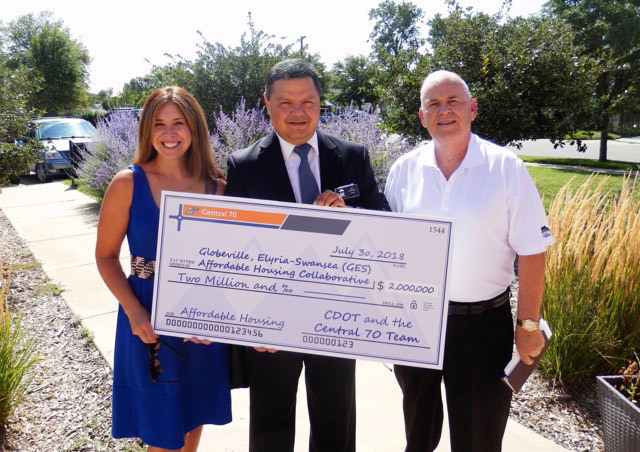 The generous $2 million CDOT grant awarded Brothers enables the collaborative to acquire single-family homes for placement in the neighborhood land trust, by which residents may own their dwellings and even resell them, while the land itself remains in trust for the community. The partners will set aside more than $300,000 to rehabilitate houses and preserve the hard-earned equity of existing homeowners. Other portions of the grant will be applied toward new construction/redevelopment of parcels/properties that also will provide affordable housing for dozens of families in the neighborhood. The collaborative will work with federal, state and local leaders, as well as foundations, to leverage the substantial investment made by CDOT.